In late 2016, I partnered with another financial advisor to help his practice and his clients achieve their financial goals. Within the first few months, I discovered that a handful of clients had been convinced to allocate an imprudent amount of their wealth to different BDC (Business Development Companies) vehicles. These vehicles were born from yield-hungry investors operating in a period of no volatility as central banks around the world opened their money spigots. To me, this was a debt time-bomb that was ready to blow. To make matters worse, these vehicles charge annuity-like expenses and restrict liquidity to the point where I found it almost impossible to help these clients get their money out of the products. But why would this financial practice put their client’s money in these products? Their practice didn’t understand these products and did not know the risks embedded in them. They believed the sweet wolf dressed like a grandma was safe, but they may end up getting devoured by the ramifications of their choices. Clients were looking for yield and the advisor made a deal with the wrong person to get the returns they were looking for. All this while knowing straw does not turn into gold, and safe investments in a zero-interest world do not produce yields of 8% to 11%. Eventually, the advisor may find out they will lose what is most important to them - their clients. The practice knew about the risks and decided the upside potential was worth the risks. 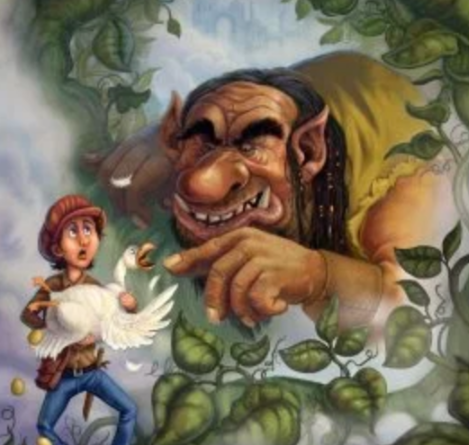 Even though stealing from a giant is a risky endeavor, the firm feels they can escape down the beanstalk with a goose laying golden eggs. The advisor knows the product is potentially poisonous, but the sweet commissions make it worth the bite. 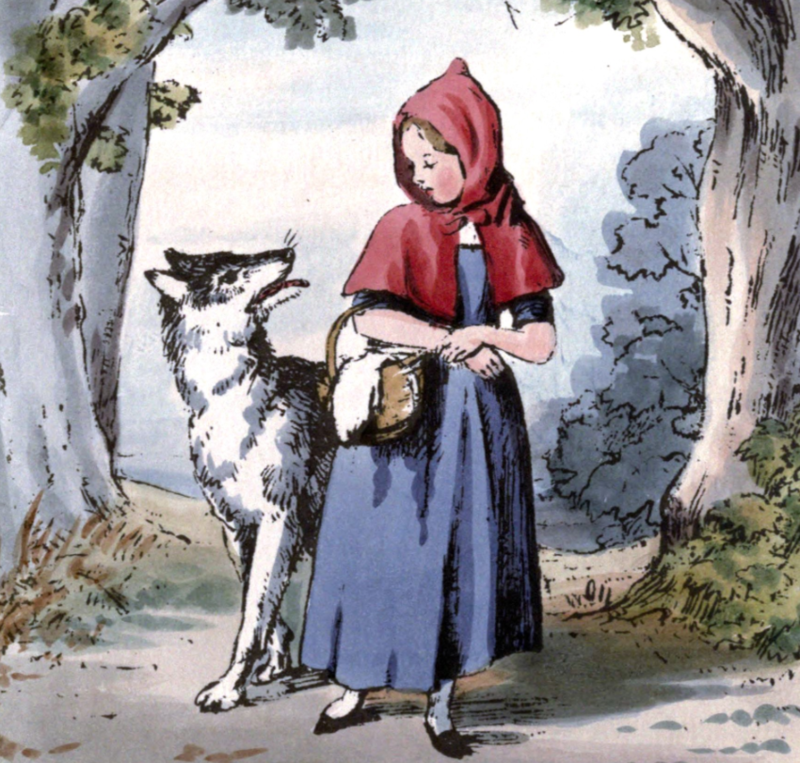 Most clients will find their advisor is playing the role of Little Red Riding Hood or Rumplestiltskin. 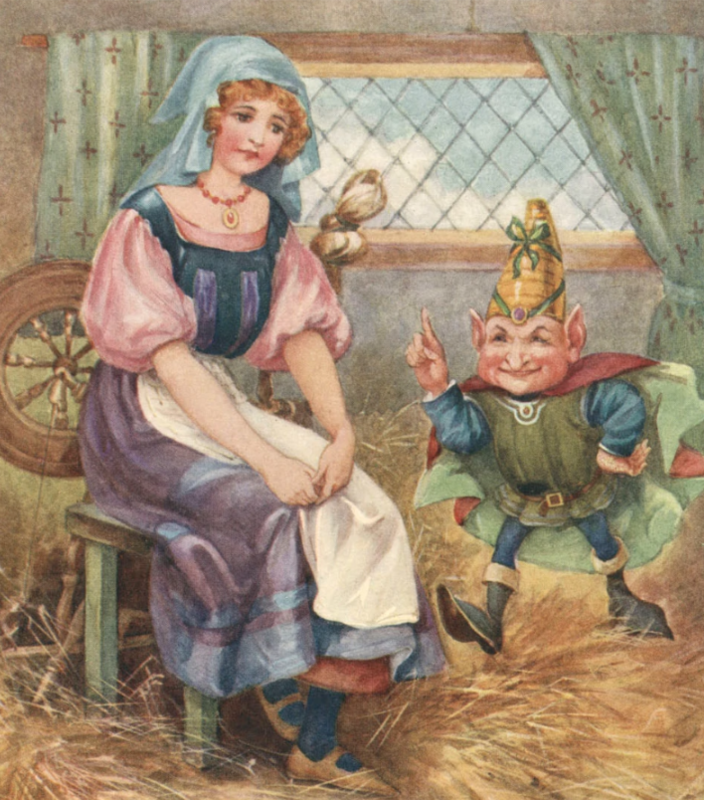 Rarely, will you find an advisor so optimistic about their ability to win this uphill battle, like Jack and the Beanstalk, that they decide to allocate to the asset class while knowing they may be killed by a giant force outside of their control. 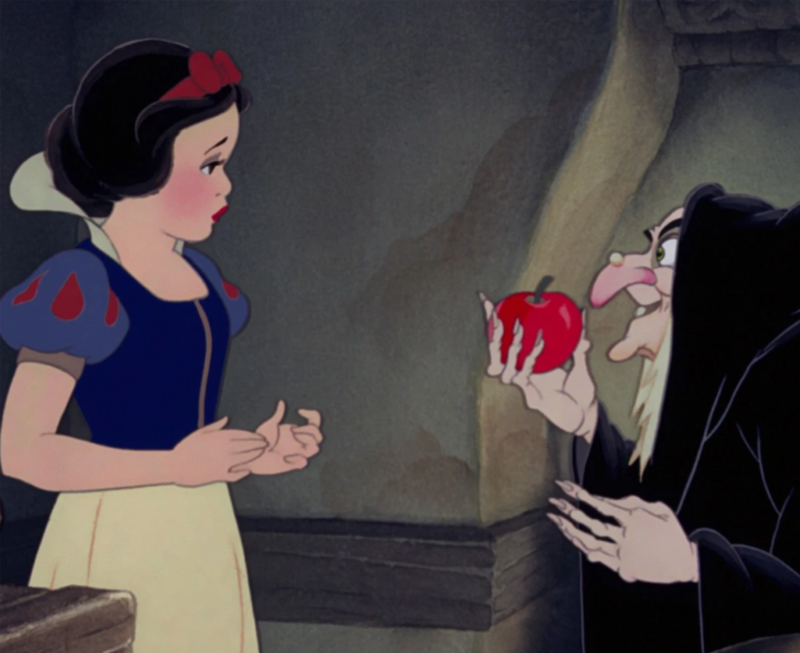 Unless, they are like Snow White and are so tantalized by the commissions these products offer that they decide to risk your money. Business Development Companies are just one ticking time-bomb in the debt market. Today, debt bombs can take many forms including: high yield bonds, senior loans (also called bank loans or leveraged loans), debt from countries in emerging markets, and even some areas of the investment grade corporate bond market. Since early 2018, Noble Wealth Partners has advised our clients to stay away from the hazardous areas of the debt market and instead focus on high-quality bonds for diversification. Let’s start by sharing information about the current environment of the bond market, the things that have changed this market cycle, and why we tell clients to err on the side of caution. What is going on in the debt market today? The debt market has evolved over the past 40 years, amidst a secular decline in interest rates, which began in the 1980s, and has forced investors to reach further into the risk spectrum to achieve their targeted returns. As investors became comfortable taking on additional credit risk (i.e. default risk), corporations have capitalized on this dynamic, spurring them to fund their growth with debt instead of equity. 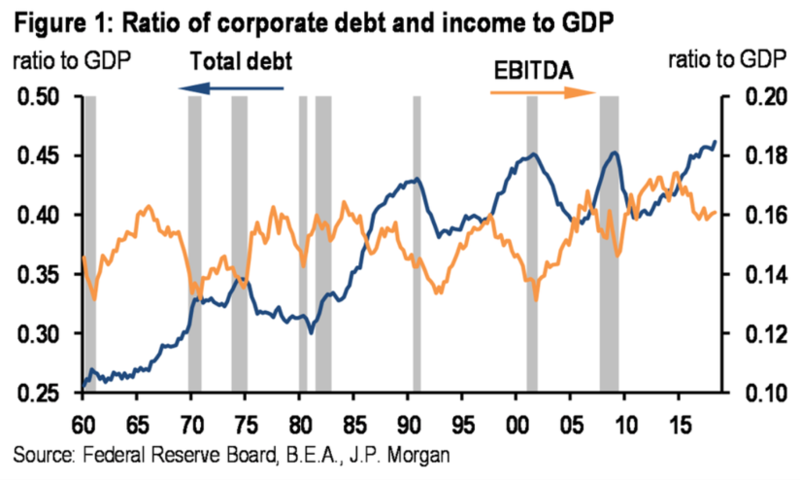 Since the 1960s, corporate debt has moved from about 25% of GDP to around 45% of GDP today. Meanwhile, earnings measured by earnings before interest, taxes, depreciation, and amortization (EBITDA) has only climbed from about 14% of GDP in 1960 to just 16% of GDP today (Federal Reserve Board). The endless supply of capital provided companies with an incentive to take on massive piles of debt. After the Federal Reserve took rates to zero in 2008, corporations took full advantage of yield-hungry investors willing to finance debt at close to nothing to leverage their balance sheet. Optimizing a company’s weighted average cost of capital (optimal mix of debt and equity), is nothing new for corporate CFOs. When debt financing is extraordinarily cheap, it makes sense to finance with debt instead of expensive equity. The troublesome development is taking on debt with the sole purpose of engaging in friendly shareholder behavior, like increased dividends and stock buybacks, instead of investing back into the business to produce sustainable shareholder returns. Think about it, would you lend money to a business if you knew they would use your money to pay their investors? It doesn’t seem like a fair deal to those debt holders. I would like to see those companies take that capital and invest into the future of the business, so they can stay competitive, and eventually pay back the debt they owe. Capital expenditures or fixed capital investment usually refers to investing a firm’s excess cash back into the business to purchase (or improve) physical assets that have a useful life that is greater than one year. In 2000, companies in the S&P 500 used 42% of their cash for capital expenditures and only 26% to pay out dividends and buy back stock. In 2018, only 26% of the cash these companies generate is expected to be used as capital expenditures and 46% is expected to be paid out to investors via dividends and buybacks (Goldman Sachs)! This debt time bomb is not limited to corporations. Individuals have also taken advantage of easy access to credit. Today, total consumer credit outstanding is over $3.5 trillion. In fact, that amount of credit outstanding is roughly equal to 25% of individuals personal income. Up from about 19% in 1990 (St. Louis Fed). The good news - consumers have learned their lesson when it comes to over extending credit on their credit cards. However, they are piling on debt in the form of student loans and auto loans. In the U.S., student loans outstanding amount to over $1.3 trillion and auto loan balances sum to over $1.2 trillion (Federal Reserve Bank of New York). These developments have morphed the underlying composition of the of the debt market. BBB credits, the lowest rated investment grade bonds for the rating agency Standard and Poors, now make up nearly half of the $6 trillion investment-grade world. In 2008, they accounted for less than a third of the total. Not only are BBB credits larger, they are also riskier. Leverage is up significantly. Debt is now 3.2 times EBITDA, in 2007, this was 2.1. A record 37% of companies have debt burdens that are over five times EBITDA (Barron's, 2018). Even the most speculative issues in the credit market have had no trouble raising money. These companies have taken full advantage of the investors willing to lend to them at ultra-low rates. If you lent money to someone that is irresponsible with their money and had filed for bankruptcy twice, do you think they would be responsible with this new cash they received from you? Maybe…but probably not. The junk-rated bonds, bank loans, and leveraged loan markets are no different. 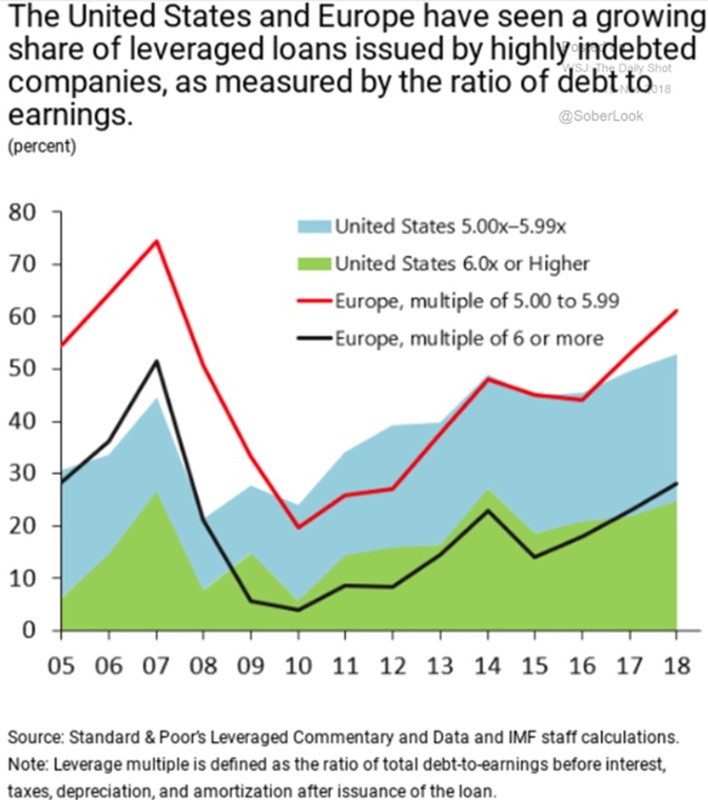 50% of leveraged loans in the U.S. and 60% of the leveraged loans in Europe have a debt to EBITDA ratio greater than five times (Standard & Poors). This is the equivalent to an individual with $50,000 of income and $300,000 of debt, borrowing additional dollars to stay solvent. These are risky loans! Yet, earlier this year, these leveraged loans were able to obtain capital at interest rates just ~3% higher than those of risk-free Treasury Bonds (Goldman Sachs). Issuers (i.e. borrowers) of emerging market debt have also seized the opportunity to borrow at aberrant rates. In June of 2017, Argentina sold $2.75 billion of debt maturing in 100 years at a yield of only 7.9%. Did investors forget this country defaulted on $93 billion of debt only 17 years ago? Apparently, creditors have a very short memory as they were willing to finance this country’s deficits for the next 100 years! But Argentina is not the only country in emerging markets that have taken advantage of lender’s optimistic attitudes. In the past 14 years, the total amount of outstanding debt located in emerging economies has exploded from around $500 billion to over $4 trillion! Most investors are familiar with the well-known saying, “A rolling loan gathers no loss.” As long as many parties are willing to lend credit to those in need, we need not fear a near-term collapse in the credit market. Those borrowers can continue to issue debt to pay down their existing obligations. Like borrowing from Jennifer to pay back Mike. But what happens if investors become frail and those borrowers are unable to access credit? Well, it depends on a number of factors. One of them being the maturity of the existing bonds. How much of their debt is coming due in the next 12 months? What about the next 24 months, etc.? This is where we see more warning signs in the debt market. The credit market will be heading into a maturity wall in 2019, with over $500 billion of loans coming due in 2019 and another ~$700 billion coming due in 2020 (Standard and Poors). If we are to head into a recession in those years, and the credit markets freeze as they do in many recessions, it could be bad news for the corporate bond market. Especially, for those speculative issues such as high yield bonds, emerging debt, bank loans, leveraged loans, and business development company loans. Corporate debt is currently at about 46% of U.S. GDP (Haver Analytics). A level that may be a harbinger to a near-term fallout in the economy. In the event we do not head into a recession in the next few years, these loans could still be in trouble. Since bank loans, leveraged loans, and business development companies usually lack the credit quality to tap into the corporate bond market, these borrowers often finance their debt in short increments with floating rates. The Fed has kept interest rates low since it was forced to put the economy on life support back in 2008. Now, the economy is back on its feet and it’s time to let the economy leave the hospital. In the chart below, you can see the gap between the Federal Funds Rate and the unemployment rate. Clearly, there is room for the Fed to let rates normalize. If the Fed adjusts short-term rates upward, these borrowers will not be able to service their debt seamlessly, and we will most likely see defaults amongst these issuers. How will these investment fare when the Fed decides to play catch up? The credit market may have already picked up on these signals and we are beginning to see cracks form. Beginning in October, the percentage of North American loans trading above their face (or principal) value, went from around 85% to around 10% in December (IHS Markit). We have also seen a clear selloff in high yield bonds and senior loans during this same period. 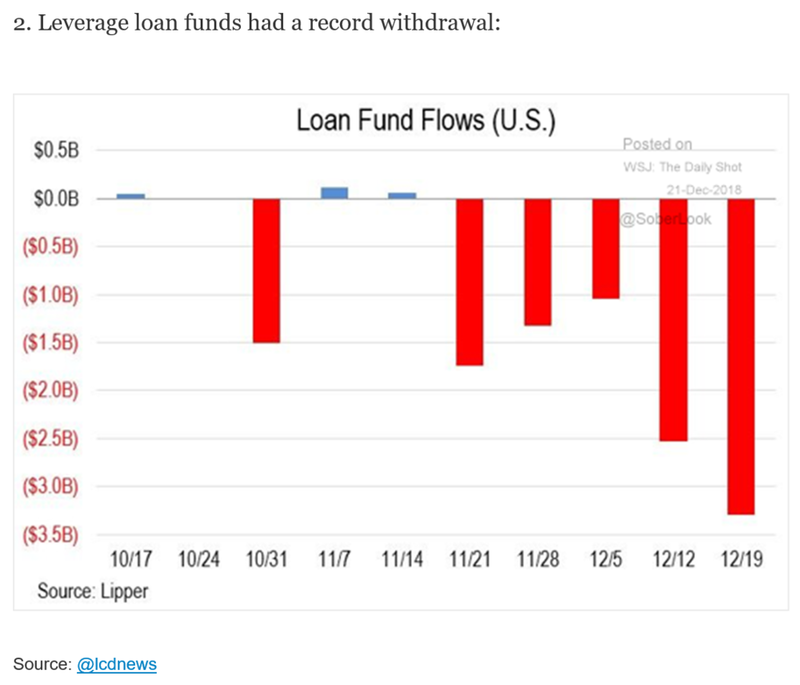 Leveraged loans just experienced record outflows in the week ending 12/19/2018 (Reuters). Perhaps, investors feel the juice isn’t worth the squeeze in these asset classes. Or, they are seeing this market for what it is, like Neo in the Matrix, as they are finally realizing these loans carry significant risks. Some advocates of this asset class talk about the seniority of the bonds in the event of bankruptcy. But what does that mean if you lent capital to a company that is over-levered, with significant liabilities, and you did not request any debt covenants to protect your investment? Well, you are senior in the capital structure to equity, but you are still lower than wages, pension obligations, and possibly other debt. If that company has liabilities roughly equal to their assets, then the equity is worthless, and your seniority in the capital structure is meaningless. Like a king with nothing to rule. Furthermore, you did not protect your investment with covenants. Traditional covenants prevent a borrower from engaging in behavior that would jeopardize the bond holders, like paying out the equity as dividends prior to paying creditors back. It may also stop a company from issuing additional debt that is senior to your claim. If they issue enough debt that is senior to your claim, your claim is worthless. Still feel good about your advisors decision to allocate a piece of your portfolio to this asset class? If you are still invested in these assets - the bomb hasn’t gone off yet and you still have time to find a bomb shelter. We would encourage you to do so. Godspeed.